The world’s largest 20 economies need to step up the pace of reforms to reinvigorate growth, create jobs and build a more inclusive global economy, according to the OECD’s annual Going for Growth report . The Organization for Economic Co-operation and Development released its report ahead of this weekend’s Group of 20 (G20) meeting of finance ministers and central bankers in Shanghai to discuss faltering global growth. In the report, the OECD highlights the turbulent state of the global economy and outlines three “policy reform challenges” that governments will need to deploy in order to boost growth. This comes after the International Monetary Fund warned of weaker-than-expected global growth and called for a strong policy response from the G20. "Global growth prospects remain clouded in the near term, with emerging-market economies losing steam, world trade slowing down and the recovery in advanced economies being dragged down by persistently weak investment," the OECD report said. It warns that the slowdown in emerging markets over the past couple of years also raises questions over whether they will be able to make further progress on closing the income gap with advanced countries. The report calls for structural reforms combined with policies to increase demand, to lift productivity and create the jobs needed to tackle inequality. · To improve the well-being of citizens, governments around the world need to address deep structural weaknesses. · Remove barriers that stifle entrepreneurship and limit the capacity of companies to make the most of knowledge and technological diffusion. · Address labour-market challenges to make growth more inclusive, including unemployment, low participation of women in the labour force and informal employment. 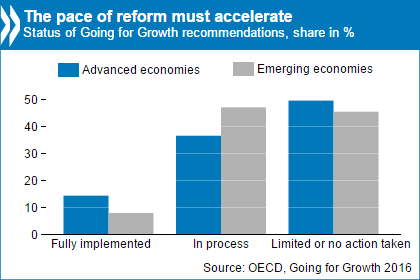 The OECD has been monitoring reforms in the G20 to help the group deliver on its 2014 pledge to increase global economic growth by 2 percentage points by 2018, through a series of coordinated structural adjustments to their economies. Speaking at a news conference on the sidelines of the Shanghai meeting, the head of the OECD, Angel Gurria, said the G20 needed to pick up the pace of the reforms. "Just at the time when we need it more, when we need to accelerate reform, there is a deceleration of reform," he said. "The question is how do we get the appetite, the conviction for the reform process, going." "The problem is, it is not happening; even that 2% we agreed on is not happening. That is something we are very worried about." The OECD said that the pace of reform was generally higher in southern European countries, such as Italy and Spain, than among northern European countries. Outside Europe, Japan China, India and Mexico were leading the reforms. The slowdown in emerging markets, particularly China, has added to uncertainty and volatility on financial markets, as ultra-low or even negative interest rates have not provided the expected growth stimulus yet, but have already reduced returns on investment. Have you read? Why is global growth stuck in a rut? What the G20 can do to boost global recovery What's really happening in the world economy?